A United Launch Alliance Atlas V rocket lifts off from California's Vandenberg Air Force Base carrying the classified NROL-55 satellite for the U.S. National Reconnaissance Office, as well as 13 tiny cubesats for the NRO and NASA, during a pre-dawn launch on Oct. 8, 2015. 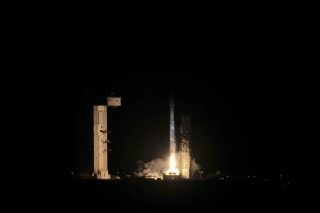 An American spy satellite and 13 tiny "cubesats" shared a rocket ride to orbit this morning, lighting up the predawn sky over their California launchpad. A United Launch Alliance Atlas V rocket blasted off today (Oct. 8) from California's Vandenberg Air Force Base at 5:49 a.m. EDT (0949 GMT; 8:49 a.m. local California time), lofting the secret NROL-55 payload for the National Reconnaissance Office (NRO), the agency that operates the United States' spy satellites. You can watch a video replay of the dazzling rocket launch here. "That was a great launch and I'm very excited," Andres Martinez, program manager for NASA's Small Spacecraft Technology Program, said just after liftoff during NASA's live launch commentary. "Small satellites provide NASA the ability to rapidly develop and launch groundbreaking technology into space." Not much can be said about the secretive NROL-55 mission, which is classified. But NRO and NASA officials have revealed details about the GRACE cubesats, which are mostly demonstrating new tech in Earth orbit. For example, two of the NRO cubesats, known as AeroCube-5C and AeroCube-7, will test out tracking and laser-communications technologies. These spacecraft weigh just 3.3 lbs. (1.5 kilograms) apiece, NRO officials said. AeroCube-7 was developed with NASA funding, via the agency's Optical Communications and Sensor Demonstration project. This cubesat will use a 6-watt laser to beam data from low Earth orbit (LEO) to the ground. Tiny cubesats are revolutionizing how scientists, students and even private companies explore and utilize space. See how cubesat technology makes satellites smaller in our full infographic. "Our goal with this satellite is to achieve communication from LEO to ground at rates that are a factor of 100 higher than what has been achieved so far in cubesats using radio-frequency communication," Richard Welle, director of the Microsatellite Systems department at The Aerospace Corporation, said during a pre-launch briefing on Wednesday (Oct. 7). Five other NRO cubesats, which range in weight from 4.4 lbs. to 10 lbs. (2 to 4.5 kg), will demonstrate new "software-defined" radio communications. The other two, which weigh just 2.2 lbs. (1 kg) each, will perform calibration measurements in the ionosphere, a region of Earth's upper atmosphere. The four NASA-sponsored cubesats are ARC-1 (Alaska Research CubeSat 1), BisonSat, AMSAT Fox-1 and LMRST-Sat (Low Mass Radio Science Transponder-Satellite). The 2.2-lb ARC-1, which was developed by the University of Alaska Fairbanks, will help test out new cubesat control and communications systems. BisonSat is the first cubesat to be built by students at a Native American tribal college; it was designed at Salish Kootenai College, which is located on the Flathead Indian Reservation in Montana. The 2.2-lb. BisonSat will conduct a variety of Earth observations from orbit, but its main mission is educational. The primary goal is "to interest our students in considering a career in the aerospace industry in the U.S., either as an engineer or as a scientist, and to help address that national need of resupplying our workforce with talented people to keep the U.S. as a leader in this area," BisonSat principal investigator Tim Olson, of Salish Kootenai College, said during Wednesday's news briefing. AMSAT Fox-1, which also weighs 2.2 lbs. was developed by the Maryland-based Radio Amateur Satellite Corp. (AMSAT). The bantam spacecraft "features an amateur radio FM voice repeater that will provide easy portable satellite communications opportunities for amateur radio operators worldwide," an NRO fact sheet about the GRACE cubesats states. The 6.6-lb. (3 kg) LMRST-Sat comes courtesy of a team based at NASA's Jet Propulsion Laboratory (JPL) in Pasadena, California. LMRST-Sat aims to help demonstrate a new type of radio-science instrument that could help reveal details about the gravity fields and atmospheres of solar system bodies, said mission principal investigator Courtney Duncan of JPL. "Once we've interacted with it in space and learned some things from that, then we'll be in a position to propose this credibly to future deep-space missions to interesting destinations such as Europa, the moon of Jupiter, or Enceladus, the moon of Saturn, or Mars," Duncan said. NASA sees big potential in tiny, inexpensive cubesats, the basic building block of which is a cube measuring just 4 inches (10 centimeters) on a side. Indeed, the space agency plans to launch such minuscule craft to the moon, near-Earth asteroids and Mars in the next few years. Today's liftoff was the 101st for United Launch Alliance (ULA), a joint venture of Boeing and Lockheed Martin that was founded in December 2006. All of the company's launches to date have been successful.